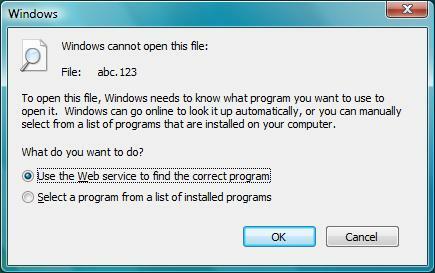 When opening a file with unknown extension, normally you will see an additional window popping up that give you options of whether to use the web service to find the correct program or select a program from a list of installed programs. Some times it is quite annoying as you probably already know which program should be used to open the file. To bypass this additional window, you can use a simple registry hack to skip the right program searching option but only pop up “open with” window instead. 1. Go to Start, type regedit at the search text box. 2. Navigate to HKEY_LOCAL_MACHINE\SOFTWARE\Microsoft\Windows\CurrentVersion\Policies\Explorer. If Explorer key is not found, then proceed to step 3, else go to step 5. 3. Right click Policies, then choose New -> Key, name the key as Explorer. 4. Right click on Explorer key, choose New -> 32-bit DWORD32-bit DWORD, then name it as NoInternetOpenWith. 5. Double click NoInternetOpenWith, enter a value as 1. 6. Reboot your computer in order for the registry key changes to be effective. Once you have completed above steps, try to open a file with unknown extension, the additional window should no longer pop up and you should only see the “open with” window that let you choose any program to open the file. If you want to have the additional window pop up, just change the value back to 0.